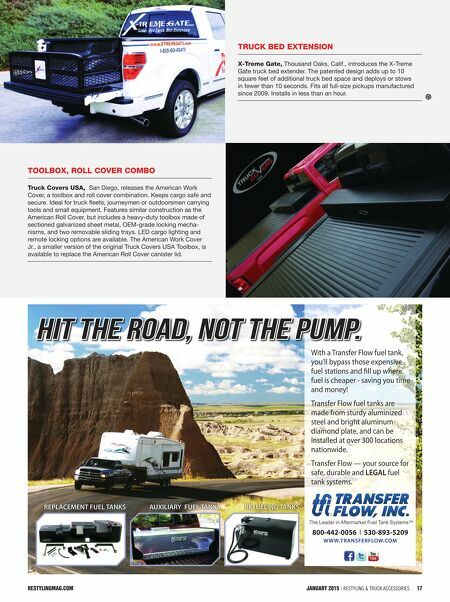 restylingmag.com January 2015 | Restyling & tRuck AccessoRies 17 truck bed extension x-treme Gate, Thousand Oaks, Calif., introduces the X-Treme Gate truck bed extender. 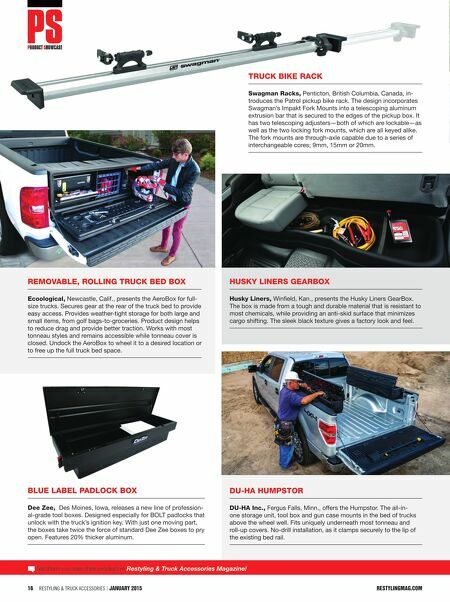 The patented design adds up to 10 square feet of additional truck bed space and deploys or stows in fewer than 10 seconds. Fits all full-size pickups manufactured since 2009. Installs in less than an hour. toolbox, roll cover combo truck covers usA, San Diego, releases the American Work Cover, a toolbox and roll cover combination. Keeps cargo safe and secure. Ideal for truck fleets, journeymen or outdoorsmen carrying tools and small equipment. Features similar construction as the American Roll Cover, but includes a heavy-duty toolbox made of sectioned galvanized sheet metal, OEM-grade locking mecha- nisms, and two removable sliding trays. LED cargo lighting and remote locking options are available. The American Work Cover Jr., a smaller version of the original Truck Covers USA Toolbox, is available to replace the American Roll Cover canister lid. REPLACEMENT FUEL TANKS AUXILIARY FUEL TANKS REFUELING TANKS 800-442-0056 I 530-893-5209 W W W.TR ANSFERFLOW.COM With a Transfer Flow fuel tank, you'll bypass those expensive fuel stations and ll up where fuel is cheaper - saving you time and money! Transfer Flow fuel tanks are made from sturdy aluminized steel and bright aluminum diamond plate, and can be installed at over 300 locations nationwide. Transfer Flow — your source for safe, durable and LEGAL fuel tank systems. The Leader in Aftermarket Fuel Tank Systems™ HIT THE ROAD, NOT THE PUMP.